VILLANUEVA'S second children's book teaches the importance of sharing and friendship. A hungry pig finds a sweet potato and shows it off to his friends, with no intention of sharing. But he learns that things are much more enjoyable when shared with others. "I come from a very large family of 11 children," said Villanueva. "Sharing was a way of life in a home with so many wants and needs. Along with my brothers and sisters, I quickly learned that friendship grows out of generosity and kindness." 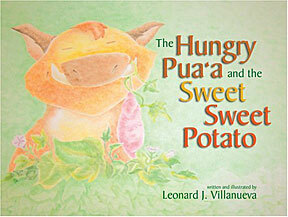 His first book, "Kaipo & the Mighty Ahi" was written for older children. He said this book, although meant for a younger audience, has a message for all readers. The illustrations were created with oil pastels. Instead of applying them directly to paper, Villanueva rubbed a small amount on the tip of his thumb for a softer look. Villanueva is a sixth-grade teacher at Honowai Elementary School, where he created a program called "Art All Day, Every Day." He was awarded the Milken Family Foundation National Educator Award for teaching excellence in 2002. 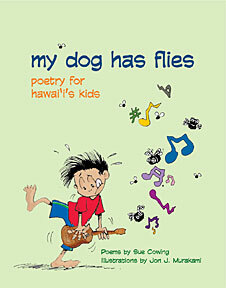 THIS COLLECTION of poetry provides miniature stories about growing up in Hawaii, written in a "Shel Silverstein-like" fashion. The poems talk about everyday local experiences from slippers to sharks, bulbuls to boars. Cowing has been writing poetry since the second grade, and her work has appeared in local and mainland journals, and in Cricket and Spider magazines. "Children are naturally interested in poetry -- its rhythms, its surprising thoughts, its way of seeing the world fresh, the way they do," said Cowling. "They love to play with language." The Hawaii Publisher's Association gave Cowing's book "Fire in the Sea: An Anthology of Poetry and Art" two Ka Palapala Pookela Awards. Jon Murakami's quirky black-and-white illustrations enhance Cowing's work. Murakami is best known for his greeting cards. This is his second children's book.